Guy Laliberté's Cirque du Soleil (a dramatic mix of circus arts and street entertainment) is considered the epitome of "contemporary circus." Infused with performance inspiration from around the world, the company produces a plethora of different shows, each with their unique storyline. While the company is known for their travelling performances, which circle the globe, performing on every continent except Antarctica, the past 20 years have seen Las Vegas become the mecca of Cirque, with nearly every MGM casino property on the Strip having its own permanent stage production on-site. With Cirque being such a dominant force in the entertainment world, it comes as no surprise that they would want to take things to the next level, which is where writer/director Andrew Anderson (Shrek, The Chronicles of Narnia) and executive producer James Cameron step in, offering a more affordable, "best-of" representation of the show, with Cirque du Soleil: Worlds Away 3D. The film begins in what appears to be Anywhere, USA, with the elfish Mia (Erica Linz) crossing over to the clichéd wrong-side-of-the-tracks to visit a rather seedy travelling circus, complete with a bearded lady and a bevy of other freaks. She spies a handsome young man (Igor Zaripov), who turns out to be the circus's prime attraction, the Aerialist, and immediately becomes smitten. It's during his performance that things go awry, as he falls from above into an ersatz Alice in Wonderland rabbit hole, with Mia chasing after. What follows is a "greatest hits" package of the many Las Vegas Cirque shows, as the young lady goes in search of her aerialist love. Travelling between enormous circus tents in an otherwise empty desert, with each tent representing a specific show, the narrative attempts to merge the storylines and performances of O, Mystére, KÀ, Love, Zumanity and the now defunct Viva Elvis. 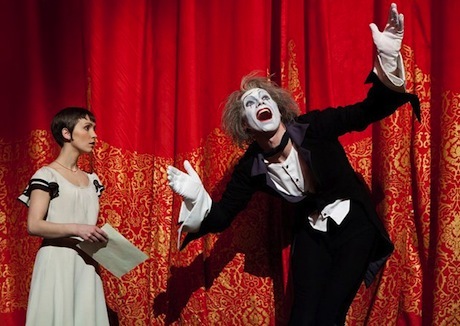 Given the strong narratives contained within the respective stage shows, each one vividly different from the next, it comes as no surprise that the film's plot is incredibly confusing and, at times, completely incoherent — particularly when moments from the Beatles and Elvis shows are injected into this metaphorical "travelling to the ends of the world" love story — going off on various tangents that make little sense. Sadly, the lack of a solid story will leave some questioning what's happening on the big screen, even with the intense visuals to focus upon. And while the visuals are intended to be the major selling point for Worlds Away, even they miss the mark. While the usage of 3D technology affords a new dimension to the various stage performances, they fail to replicate the physicality and sense of danger viewers experience when seated in a theatre. One example is the enormous 360-degree rotating stage featured in KÀ — a technological wonder and a true sight to behold — which looks disproportionate and awkward when viewed on film, something exacerbated by the forced perspective of movie, which doesn't take into account the freedom of the wandering eye when watching a stage production. While Worlds Away is perplexing on the narrative front, having the task of forcing a story onto a series of thematically disconnected vignettes, the acrobatics and cinematography have definite visual appeal. Those familiar with Cirque du Soleil will find much to reminisce about while those unfamiliar, but keen on 3D visuals will be entertained.